Alcatel-Lucent featured as the Most Innovative Solution Provider @ #BBWF 2014. “The annual Broadband Infovision Awards have once again taken place at the Broadband World Forum, honoring technology innovations from 12 categories across the broadband sector. Among the winners, announced at a gala ceremony at the Renaissance Amsterdam Hotel, network specialist Alcatel-Lucent managed to pick up two awards. This year’s judging panel was made up of members of Broadband 100, the industry group including senior leaders from companies such as Telstra, Deutsche Telekom, Orange and Volvo Cars.” Alcatel-Lucent is a double winner at Broadband Infovision Awards by Auri Aittokallio. Left: Alcatel-Lucent’s Hermann Buchegger, Jan van Tetering and Geert Heyninck. Center left: Alcatel-Lucent’s Andreas Lemke, Sue White, Jose de Francisco and Geert Heyninck. Center right: Jose de Francisco and BBC’s Laura-Jane Rich. Right: Geert Heynick on stage. BroadBand World Forum is an annual ecosystem event focusing on telecoms. BBWF is positioned as a prominent fixture in the fixed broadband industry. Informa, the producers, hosted this year’s at Amsterdam’s RAI Exhibition and Convention Center. BBWF’s Infovision Award Ceremony took place at Keopelkerk Dome where Laura-Jane Rich of BBC’s Click team was the MC. It is worth sharing that Tim’s article provides insights on the so-called new “softwarized” network environment. His writing also features comments by Brett Brock of Cox Communications who I last met just a few weeks before BBWF at IIT’s Real Time Communications where I chaired the conference’s Cloud Track. Brett emphasizes the need for addressing speed and scale in the midst of trade offs that network operators make when prioritizing either one. His take is that virtualization is a game changer, which involves new workstyles and processes. Long story short, this is not business as usual in the telco space. Back at Real Time Comms, Brett presented “NFV: Infrastructure as Code,” which examined how modern software development intersects with network engineering. If interested, you can click on the slide titled “Paradigm Shift” to display his presentation. unbundling by decomposing services and decoupling functions to leverage shared resource pools. No need to get bogged down by semantics, but the fact is that communication networks typically involve a great deal of software development. Most typically, the former prioritize performance while the later optimizes for ease of development and scalability. Them both involve pros and cons that translate into significant economic and operational differences depending on the use case. Or, simply put, in NFV’s case this is about network functions working with smarts and data distributed across multiple virtual machines while sharing a common pool of resources and processes. This also talks to going beyond traditional make/buy and supply chain analysis to embrace FOSS (Free Open Source Software) and toolsets spearheaded and developed by communities, such as OpenStack, and new cloud ecosystems in the making. Just to be clear, everything telco is digital in this day and age. Software is embedded in the industry’s DNA. So, the current focus is on “deconstructing” architectures and figuring out what it takes to make things programmable and dynamic, including the notion of predictive analytics, machine learning and “flexible automation” down the road. When working on Intelligent Networks, my experience in product management and professional services was that technical prowess alone does not move the needle to a noticeable enough degree until shifts in value, investment, procurement, pricing and accounting considerations are all factored. More on how to cross that chasm in subsequent articles on this blog. It’s now time to circle back to BBWF. 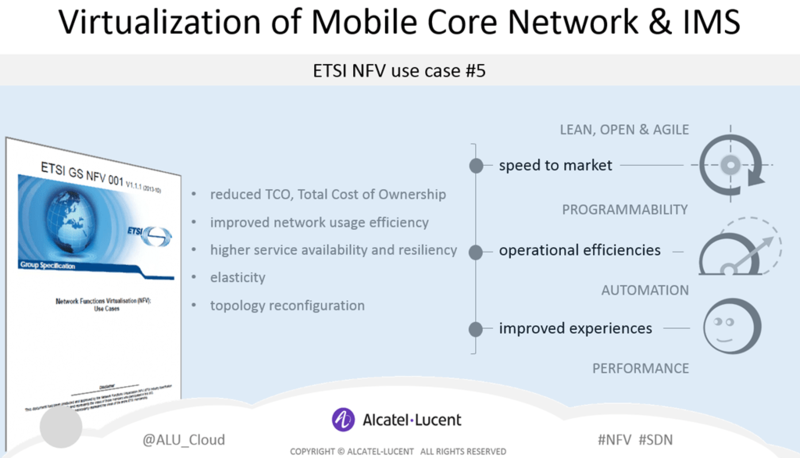 The above shows a snapshot of the NFV Discussion Tool leveraged for conversations on VoLTE (Voice over LTE, Long Term Evolution) with network operators, government officials, analysts and partners at BBWF. 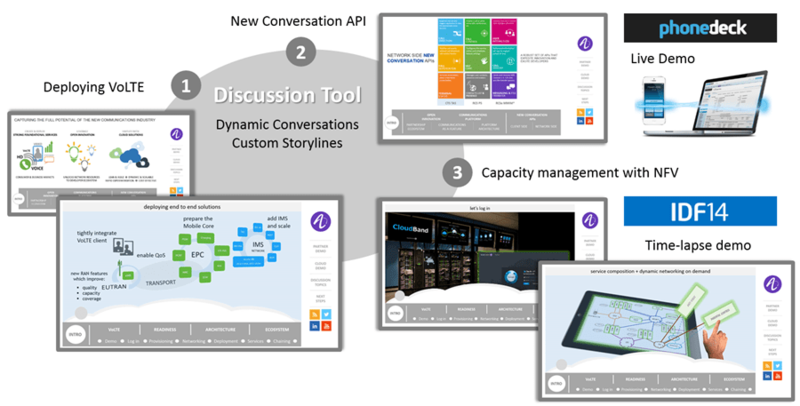 This version of the Discussion Tool runs on an Internet browser, is neatly organized by relevant topics and features supporting infographic style visuals. All just a single “click” away by means of always-on floating menus. When working on information architecture and concept visualization, we strived to make it easier to address, navigate and interact with complex subjects, avoiding self-defeating information overload. This kind of a conversation experience allows dynamic storylines to be crafted on the fly, instead of relying on a repetitive and mostly linear storyboard. Basically, pertinent insights are delivered on a need to know basis when relevant. We instantly factored knowledge, interest and available time given the conversation each conversation flow. We purposely stayed away from “presentation” monologues and operated more on a “consulting” discussion mode. Compelling and engaging demos drove our points home and helped provide with relevant experiences and the wow factor to understand and retain key concepts. Last but not least, demos prompted the next level of questions, deeper dives and richer conversations. As far as the guiding narrative, with most early 4G deployments first focusing on mobile broadband (high speed wireless Internet access), many users are not fully aware of the fact that previous generation and older networks are still handling voice calls. VoLTE gets both running on the 4G network instead, and it does that with high definition voice. Voice and video calls can then take full advantage of IMS (IP Multimedia Subsystem) technology. 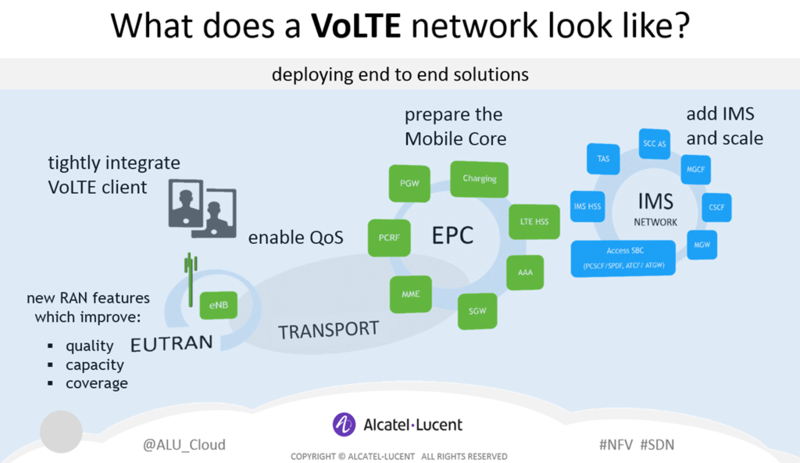 Moreover, beyond any benefits related to operating under just one and better network environment, VoLTE is about new communication experiences. NCAPI (New Conversation APIs, Application Programmable Interfaces) is an Alcatel-Lucent program exposing network resources to software developers to that end, which Gilles Duboue covers in this video. Speaking of third party developers, I would like to thank Alexander Roth for demonstrating how an ecosystem partner, Phonedeck in this case, utilizes Communications as a Feature. Alex joined me at BBWF to illustrate how a Salesforce user receives an incoming call, which he/she picks up on a laptop’s web browser. 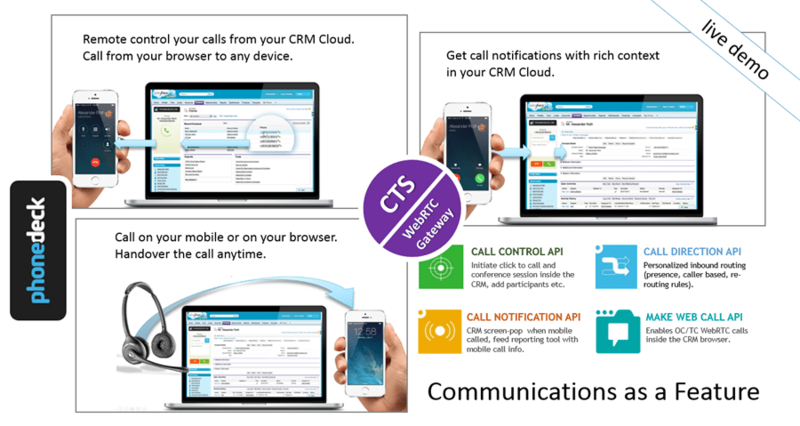 This automatically displays the caller’s customer data and relationship history, placing the call in context. When the user needs to move to another location, the phone call continues on his/her mobile phone thanks to a seamless handover that is completely transparent to the person he/she is speaking to. This live demonstration was very well received and Alex does an excellent job at explaining how NCAPI delivers for Phonedeck’s users. So, thanks again. Early on I referred to decoupling concepts in the context of network engineering and virtualization practices. Let’s now connect the dots. The same can be said about developing end user services where most of today’s applications consume resources and engage processes available from different domains via API. The bulk of today’s applications are, therefore, examples of distributed systems by design. APIs are interfaces that link at least two separate components. I know that I am stating the obvious, but the point is that the behavior of the underlying component is of the essence, just being able to interface with it is not good enough. Holding that thought, let’s talk about what success looks like. In this best case and highly desirable scenario, a fast growing number of developers work with an also growing number of APIs. As a result, innovation flourishes. This means many more new services being deployed, where more of the network resources and processes happen to be requested and consumed. And, by the way, quite a few “on demand” and only as needed. Growing end user demand adds a multiplier factor, a network and, possibly, viral effect. In this chain reaction, would there be enough capacity to meet demand, will the network operator scale fast and far enough, or can history repeat itself and become a victim of success? Those of you familiar with these issues might have already guessed that the stage is set for the cloud demo. 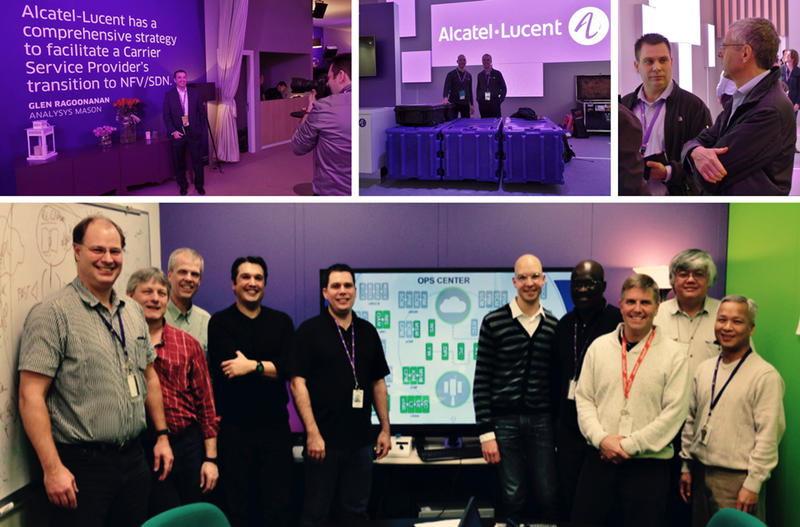 The above portrays a time lapse version of a live demonstration first deployed at IDF 2014 (Intel Developers Forum) in September, where Alcatel-Lucent was the recipient of a “Best in Show” award in the Software Category as well as being honored with a “First” mention in Cloud. Our Cloud Innovation Center shows how to automatically deploy a virtual EPC, making mobile broadband available immediately after. It then proceeds to add a virtual IMS to the mix: VoLTE becomes a live service on the spot. It takes less than one hour for this NFV system to deliver the goods, right scaling and chaining other value added services, such as Phonedeck’s application, in the process. Compare that to conventional architectures taking months and even more than a year to deploy. We now need to insert economics in this picture: I would like to single out the “opportunity cost” which is typically defined as the loss incurred when giving up a valid alternative. This consistently came up in business case conversations with global network operators wherever concerns were raised around timely innovation and sustainable competitiveness. From a risk management standpoint, disruption materializes as the migration of value and disintermediation. This is about measuring the opportunity cost incurred when typically waiting for more than a year to launch a new service, compare that to [a] faster time to market for [b] multiple services instead and starting with [c] significantly lower budget thresholds. My recollection is that Dimitris Mavrakis’ address at the Infovision Awards Ceremony touched on that topic as well when he shared that out of the five days that it takes Facebook to get a new service up and running, more than four are taken up by a network operator’s lead time (execution latency that is) and figuring out how to work with them. Leading by example, our company’s investment strategy shows a strong commitment to getting key network functions delivered as VNFs (EPC and IMS being two leading examples) and our portfolio includes CloudBand’s NFV Platform, Cloud Nodes as well as Nuage Network’s SDN solution… all at the time of writing this already and with more announcements to come soon. Overall, BBWF 2014 was a very productive event for our team. Those of us focusing on NFV were kept busy from beginning to end. There is a need for thanking and crediting Lisa Horianopoulus and her team for all of the effort put into designing our presence and organizing a number of activities conducted at this event. Additionally, I’d like to express my gratitude to Gilles Duboue for work done in advance and, as usual, kudos to the team at the Cloud Innovation Center. Click on the above mosaic to access the photo album on Flickr. See the Cloud at BBWF 2014. Interview with Michel Combes, CEO, Alcatel-Lucent. We are gearing up for BBWF. Alcatel-Lucent’s booth will feature seven simultaneous demonstrations. I will be there at Area 3 Demo 1 to discuss VoLTE (Voice over Long Term Evolution) in the context of NFV (Network Functions Virtualization) and the Carrier Cloud. Long story short, our industry is fulfilling expectations on the so-called “the network is the platform” paradigm. This is now possible by adopting cloud computing technologies and opening what effectively become shared resource pools consumed on demand via API (Application Programmable Interfaces). This model advances by taking down silos as vendors such as us (Alcatel-Lucent) and our partners can now rapidly deploy applications leveraging the same infrastructure and platforms. Not amused yet? Compare that to lengthier and far complex conventional deployments where more expensive, tightly integrated software stacks and black boxes have come to depend on dedicated hardware and fragmented management, not to mention issues arising from redundant functions, overhead, mind boggling trouble shooting and poorly utilized systems negating ROA (Return on Assets). SOFTWARE CENTRIC – having decoupled control and data planes, application logic from service data, we are now immersed in a more dynamic an agile software defined service environment. OPEN & EXTENSIBLE – the network becomes an abstraction that is transparent to the developer, enabling the application to consume resources and leverage processes via API. MULTI-TENANT – the underlying fabric and resulting cloud communications platform allow for application multi-tenancy and achieve so under a multi-vendor’s best of bread model. AUTOMATED – a catalog presents applications which can be automatically onboarded via templates / recipes, then provisioned and deployed in no time. SCALABLE – applications, whether VNFs (Virtual Network Functions) or end user facing online services benefit from dynamic service chaining, meeting demand curves by growing and degrowing as needed. PROGRAMMABLE – programmability and context awareness drive the orchestration of events and resources involved in end to end lifecycle management, which then become subject to automation and iterative improvements. PLACEMENT – the efficient placement of loads entails analytics and algorithms understanding when is best to centralize and consolidate or to leverage distributed systems, all based on capacity management rules and SLA (Service Level Agreements). ECONOMICS – feature and performance parity are achieved under leaner and cost efficient operations, a smaller physical footprint, and significantly lower opportunity costs and, therefore, risks. As Michel pointed out in the above interview, the telecommunications industry is no longer at a cross-road pondering what the future might entail. After having been involved in cloud projects for the past five years, it is clear that we are facing a point of no return, which is forcing a path forward. The industry’s cloud journey has already begun. This is not about “drinking the Kool-Aid” and marketing spin. Most would agree that legacy systems that served the industry well can now lead to network bloatware and a patchwork, unable to gracefully scale as demand shifts. Many would also nod their heads when acknowledging that the above concepts are not really new to the telecommunications industry: them all have been broadly discussed in the past twenty years or so. But, this time around, current attempts benefit from dramatically different economics, a new ecosystem, lessons learned and proven IT models that are leading the way. Given the fact that we are discussing emerging technologies and disruptive rather than incremental innovation, this is not without the usual challenges involving next generation systems. So, in our discussion we will also look at maturity levels, technology readiness, pivoting in the midst of market changes, talent, organizational behaviors and lessons learned, and I will be happy to discuss NFV economics. AREA 3 DEMO 1 – VoLTE Innovation and Growth – What Services to Launch. 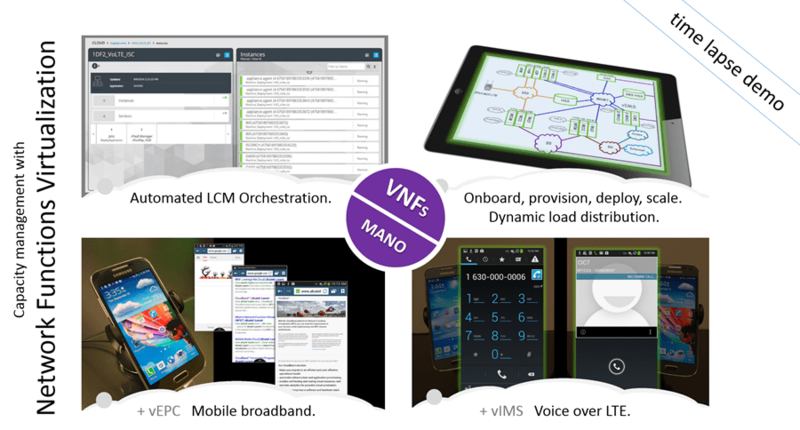 AREA 3 DEMO 2 – Dynamic Services with NFV and SDN.